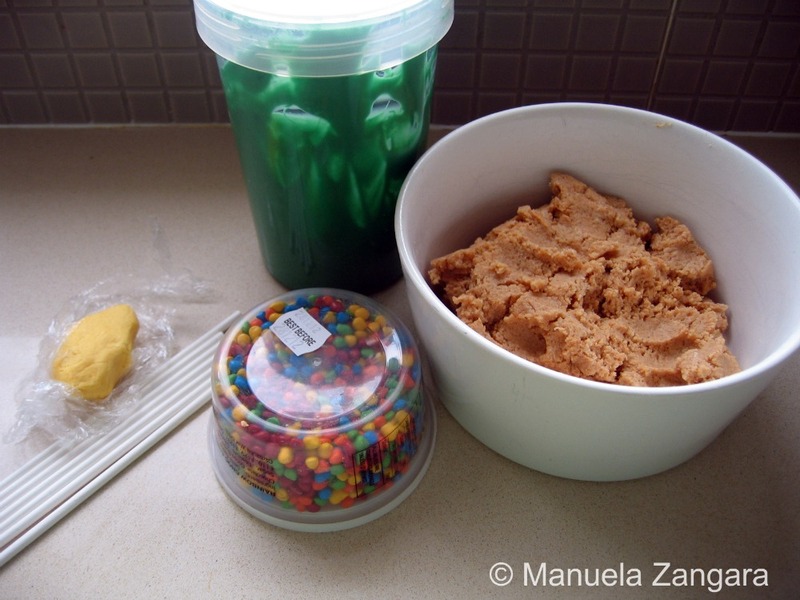 After making Dorothy the Dinosaur cake pops for my youngest daughter’s birthday, I had some green candy melts and some cake left over. I froze the cake and decided to male some cake pops for Christmas. 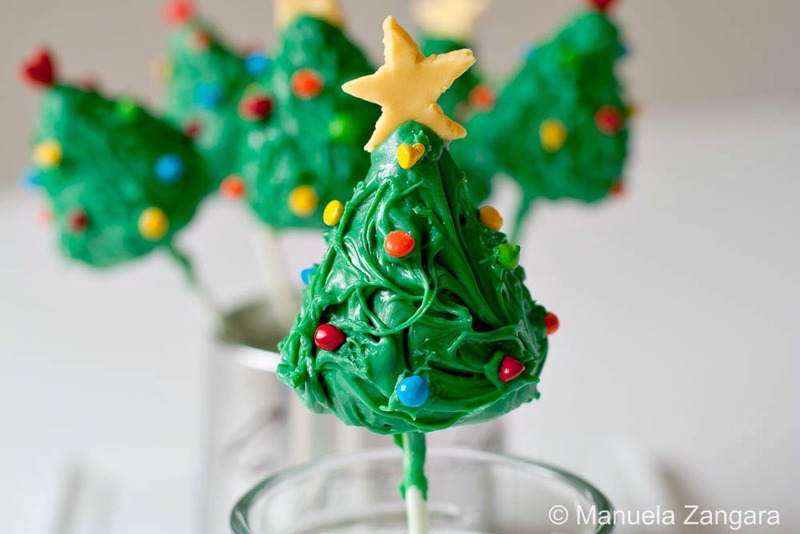 Having green candy melts, making Christmas trees was the easiest thing that came to mind. 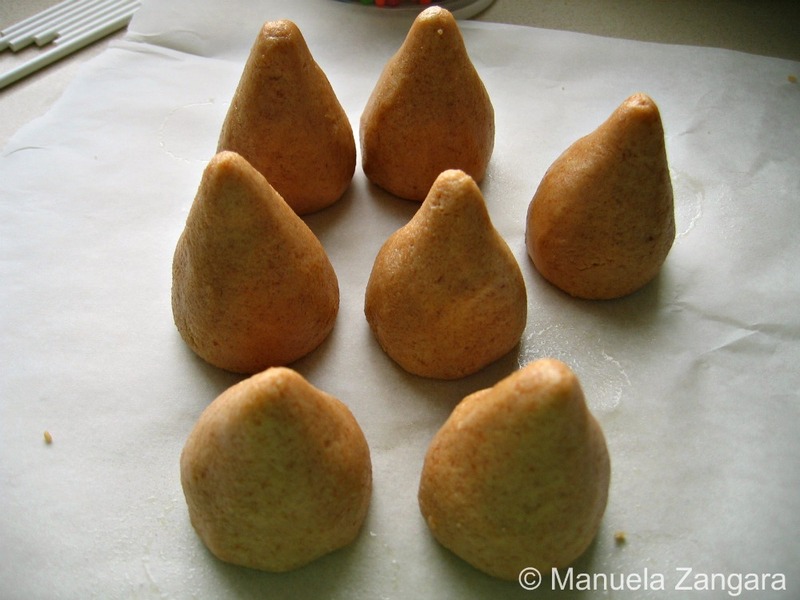 I had already seen them in Bakeralla’s book, so they were easy to make. I also had almost all the “extra decorations” to make the tree ornaments (I used rainbow chocolate chips). The only thing I did not have were the jumbo star sprinkles… so I used jumbo hearts and made some yellow stars with fondant. NOTE: I have used Wilton’s green candy melts for this. In the past, I have also used Wilton’s pink candy melts and both times, I had a hard time working with them. The candy melts are way too thick! I have also used CK’s white candy melts before and liked it so much more! I’ll have to keep experimenting! 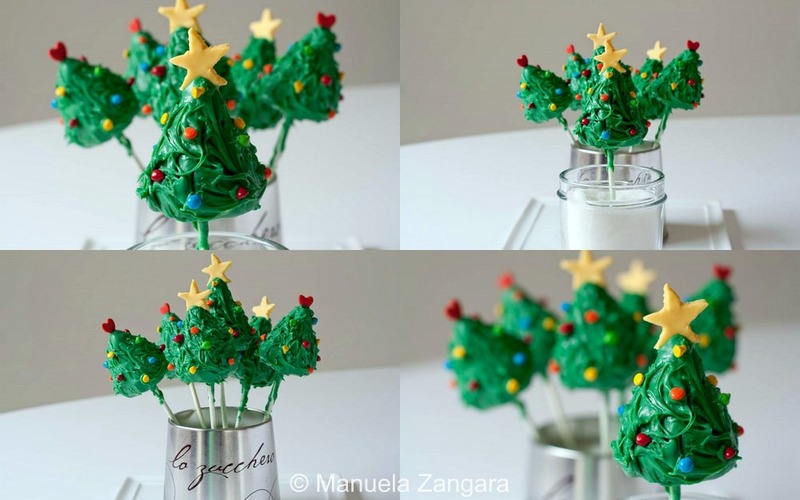 Make the cake pop mix and shape it into cones to make the tree. Put the cake pops on baking paper. Keep them in the freezer for 15 minutes and start preparing the candy coating. Melt it following the instructions on the package (I microwave them as I find it easier). Also make sure you use a deep enough plastic container to melt the candy so you can dip the candy pops in it. When ready, take all the cones out of the freezer and put them in the fridge. Keep only 5 on the benchtop and start working with these. Take a pop stick and dip it in the candy melt (2 cm/1 inch). Insert it in the cake pop no more than halfway through and keep it aside. Do that for all 5 pops. Then take the first cake pop and dip it into the candy melt. Make sure it is fully submerged and that the candy coats the stick. Then pull it out in one movement and remove the excess coating by tapping your left hand on your right wrist and turning the pop at the same time so that the coating gets evenly distributed. Before the coating dries, take a toothpick and drag it gently through the coating to make the branches. Add the star or heart on the top of the tree and put the pops vertically on a piece of Styrofoam to dry. 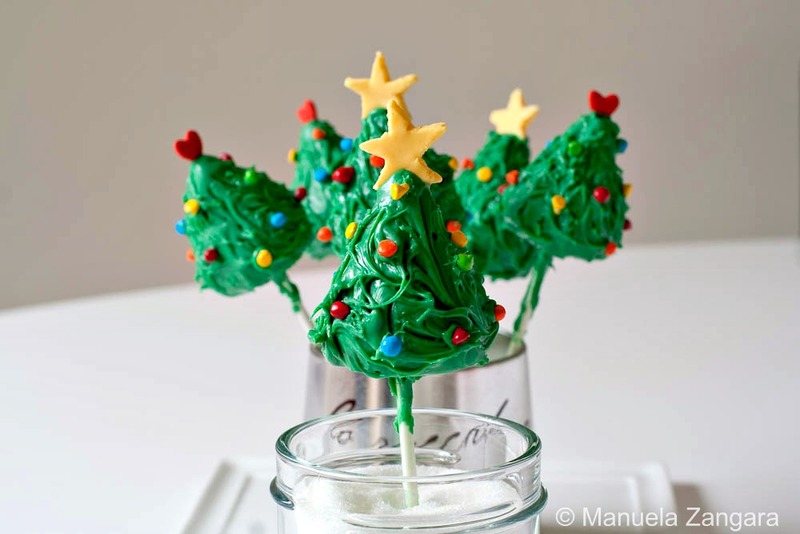 When dry, apply some candy melt to the tree using a toothpick and attach the rainbow chocolate chips as ornaments. 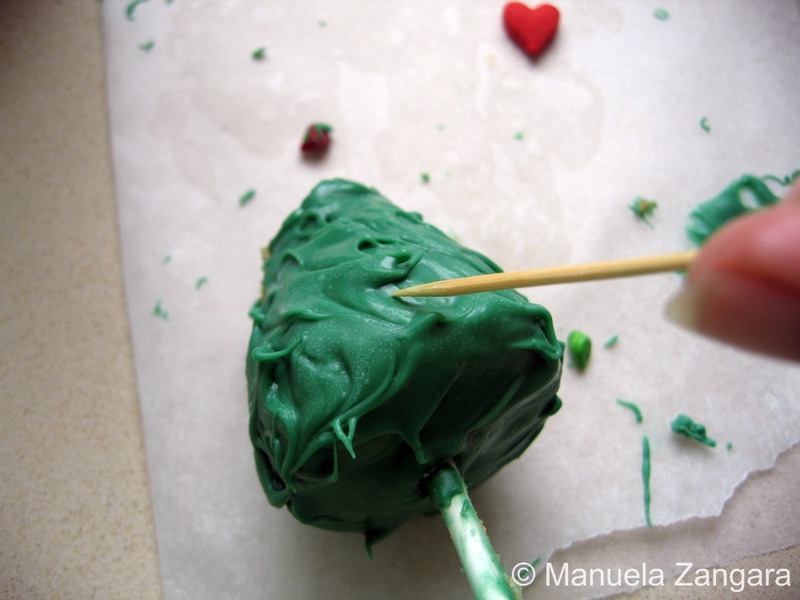 Let the cake pops dry completely on the Styrofoam before serving. These are the cutest little things ever!!! Merry Christmas to you and your family!